LemonAid Fund awards scholarships yearly, based on need and merit, to 45 students ranging in age from early childhood to high school. 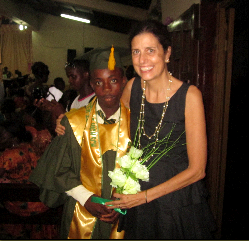 Most scholarships are partial as we partner with parents and schools to empower children and families. As LemonAid Fund network schools increase in quality the scholarships to those schools become even more valued by both parents and children. With Dele Peddle International School being the number 1 school in Sierra Leone by test scores the value of the scholarships to this school become more sought after awards. Because of our donors generosity we have been able to go beyond primary and secondary school scholarships to award scholarships to students at the university level and extend scholarships to those attending vocational school. In 2011, the women at the vocational school were selected to attend the US Embassy’s special program due to their excellent grades, outstanding attendance and all around achievements. Awards are based on need, hard work, achievements and willingness to give back.